I'm still working on my quest to find healthier bento desserts when I decided we needed our own Homemade Granola Bars. This might be my favorite dessert yet. 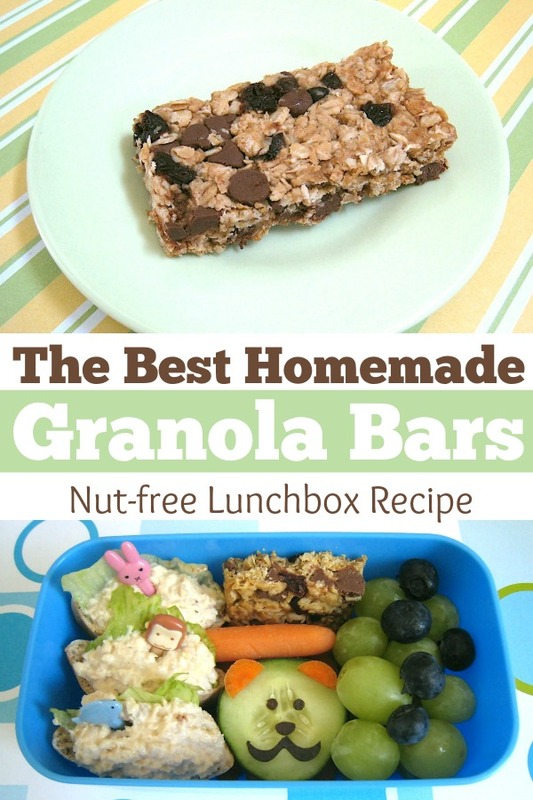 I absolutely love granola bars to begin with and have been desperately looking for a good recipe with no peanut butter in it, since both my kids dislike peanut butter. This one uses honey to bind it all together and no extra sugar added. Now, I will say that *I* wanted these and opted for chocolate chips & dried cherries. You probably could make them healthier with nuts (unless you have my kids), other dried fruits, coconut, raisins, etc. But I wanted chocolate chips. And cherry goes really really really well with chocolate. Again, these aren't meant to be health food, just a healthiER treat than store bought. At least I know what's in these. In a large mixing bowl combine oats, flour, baking soda, and any spices you want to use. In a separate bowl, combine vanilla, oil, and honey. Pour wet mix into dry and stir to combine. Stir in the "stuff" you want to use. Spray an edged cookie sheet or pan with cooking spray and press VERY firmly into cookie sheet. (I used a 7x11 pan that was perfect for this). Bake at 325 for 18-20 minutes until top is turning golden brown. Remove from oven and firmly press down bars again with a spatula or similar, and allow to cool for 10-15 minutes. Cut into bars--they are hard to cut if you allow it to completely cool. Allow to finish cooling completely before removing from pan. If the mixture seems too crumbly, add extra honey by the teaspoon. I'm not sure why it sometimes needs it and sometimes doesn't, but I think it might depend on the fillers. Add slowly though, it's easier to add more than remove some! Press the bars firmly down in the pan with the flat edge of a spatula before baking. Do this again after baking, and once more before you cut it. If they aren't packed down, they will crumble. Check out the dessert tag for some of our other experiments! My kids love the store bought trail mix granola bars but I was trying to find a healthier replacement for them, I think this will do the trick!! I'll be adding dried cherries, almonds, raisins & a few chocolate chips to keep it fun. Thanks for the recipe!! OOH I have tried granola bars before but wasn't thrilled. These look yummy. I will be trying them. Thanks for sharing!! Hi! Those bars look great, and really, they can't be too bad for you with that much good stuff in them. I will try to make them sometime for my 2.5 year old son who loves the Quaker Chewy, low sugar granola bars. I just found your blog recently and hope you continue it at least until my son starts going to school. I hope it will encourage me to send him off to school with such cute and nutritious lunches, since there's no way he's eating school lunches. Blech. Oh, and by the way, we live kinda near each other - I'm in Denton. Hi There!....Unrealted to this post, but I've been meaning to ask: Could you PLEASE PLEASE do a post on a tutorial of how to make the hardboiled eggs into shapes. I saw one blurb you mentioned about it, but I still dont quite understand. It would be great if you could do a step-by-step post with pictures and descriptions. The shapes are easy to make, but the catch is you'll need molds for it. Once you have the molds, all you do is boil the eggs, let sit in hot water for 15 minutes, then peel while still hot & put in the mold to cool. ummmm...... YUM!!!! those look amazing! I made your strawberry oatmeal bars last week... can't wait to try making these. Thanks for sharing!!! Ok, I tried to make these and they ended up being way too dry! Do you know what I did wrong??? I'm not sure. What filler did you use? I've had them mixed and not like the way they felt in my hands, so added a pinch more honey, but that's all I can think of that might help. Shannon, my try at these granola bars were also very dry as the popes mentioned. theres only a quarter cup of oil and a half cup of honey, is this correct? My Mum mentioned that she thought this was way too light for the recipe and so the granola doesn't "glue" when you cook it. I'm going to have to edit this. I mix them like this, then if they seem too crumbly, I add honey or oil by the tsp till I like the consistency. Not a ton more, but I am thinking it might depend on the filler. The chocolate chip/cherry was fine, but the apple/cinnamon needed more honey. Can I just say how excited I was to find a granola bar recipe with no extra sugar in it?! Sugar tends to make me sick faster than most other people and its great to find options with natural sweeteners and not too much of it. I made these with craisins, shredded coconut and some dark chocolate chips. Nice and sweet but without a bucket-load of brown or white refined sugar on top of the fruit and chocolate. It seemed a little dry when I was first mixing it but I didn't have to add any extra oil or honey. They stay together as well as any other homemade granola bar I've tried. Thanks so much for sharing this recipe! I would love to know how you store these--room temp in air tight container? fridge? Can they be frozen? 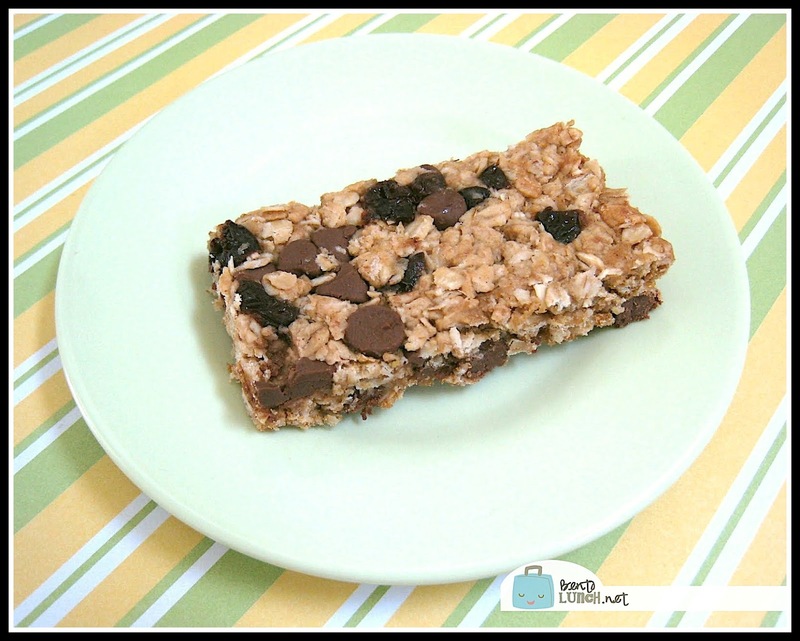 I've tried several homemade granola bar recipes and this is by far my favorite! @M. I have frozen them before and they come out just fine. Usually I keep them airtight in the fridge, but we live in TX, so it is too hot to leave food out right now. In the winter, we can do airtight on the counters. We made these with dried strawberries and pecans today and they came out great. My 3 year old AND my husband both loved them! I did have to add a little extra honey, but only about a tablespoon. My friend just sent me the link for your blog. I was needing help finding lunch ideas for my very picky 7 year old. I will have to try these granola bars! My daughter is allergic to nuts, so these sound so awesome. I'm printing your recipe. Thanks for sharing. I hope it works. My last attempt at granola bars was a disaster. Truly. But I so want to try again. These are absolutely AWESOME! My kids beg for them! I use half regular rolled oats and half 7 grain mix, and also add ground flax and a little bit of oat bran for extr fiber my kids need in their diet. The first time I made these I followed the recipe to a T...with the exception of remembering that you had halved the recipe. I dumped it into the a regular baking sheet, realized my mistake after a few minutes in the oven, then quickly mixed up another batch and combined the two and they turned out perfectly! The kids thought it was extra special that they got "chocolate" granola bars! I subbed agave nectar in this batch because I ran out of honey! Let's hope it works! Next time I am going to use coconut oil instead of canola because it's healthier. Thanks again for the great recipe, I've been making these at least weekly! Hi, these look great but do you think agave or maple syrup would work in place of the honey? Pinning to try later. Hi,I'm pinning this to try later but do you think agave or maple syrup would work in place of the honey? Thanks! I think these look delicious.